Kyrie Irving has requested a trade away from the Cleveland Cavaliers and, unsurprisingly, the Boston Celtics have been mentioned in these trade rumors. I’ve seen suggestions by fans and analysts alike that the Celtics should trade Isaiah Thomas and some other pieces for Irving. I can tell you first-hand, we don’t want him. There is a blanket thought around the NBA that Kyrie is a better player than Isaiah. That being said, there are a few reasons why Celtics fans would much rather have Thomas over Irving. Firstly, Kyrie just requested to be traded from the Cavaliers. Cleveland has consistently been an NBA powerhouse ever since LeBron James moved back. Why would Boston believe they have any chance of keeping him once he hits free-agency when he is forcing himself out of the great situation he already has? Irving obviously has intentions and motivations other than winning. He wants to be the undisputed star of the team. And while that is somewhat understandable, I personally do not want anyone on the Celtics that isn’t 100% committed to winning above all else. Isaiah has shown his commitment to the team in green very clearly. Another thing that people tend to ignore when discussing the two point guards is that IT’s numbers were better than Kyrie’s last year. He still averaged more points, assists, and a better free throw percentage, while also playing in seven more games than Irving. Other statistical categories in which the Cavalier has an advantage over the Celtic, such as steals, field goal percentage, and rebounds are all given by a very slim margin. Thomas also attempted slightly less shot attempts per game, despite being the focal point of the offense. In addition to this, Boston had a better record in the East than Cleveland last season. We can’t expect for Kyrie to perform any better than Isaiah did. In terms of strictly the numbers game for the 2016-2017 season, The Celtic has to have an advantage over Irving in a debate over the two. 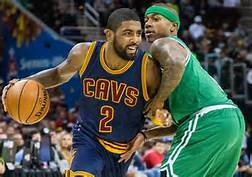 #Celtics fans: Would you trade Isaiah Thomas and the 2018 BKN pick for Kyrie Irving? The people that argue that Kyrie would be a more important player than Isaiah think that youth is more important than it is. Irving is three years younger than Thomas. However, while age in the NBA certainly does matter, especially to a team with the build to win both now and in the future, a 28 year-old Thomas is not an old man. He is in the midst of his prime, one that may last into his mid-thirties, giving Boston plenty of time to enjoy his services. Also, Isaiah outperformed Kyrie last season. To say that it would be more beneficial to have the younger player just doesn’t really make sense if Thomas continues to show out like he did last season. Isaiah Thomas has the potential to be one of the most important Celtics of all time. This might be quite the brash statement, considering he plays for the most storied franchise in the history of sports. However, IT has become one of the best players in the league, and has catapulted Boston into being a contender. His presence alone has sped up the process so quickly that the Celtics only took a year out of the playoffs after beginning their rebuild. I believe that if the Celtics win an NBA title with Thomas on the roster, his legacy and importance will be solidified amongst Boston’s finest. In a vacuum, LeBron's right-hand man might be the all-around better player by a slim margin. That being said, there are very few players that can completely change the course of a franchise like Isaiah has. Next time someone mentions the argument of Thomas vs. Irving, remember the numbers, the loyalty, and the impact IT has had on the Celtics.